A small tree with a curving trunk, to 20 feet tall and a trunk to 12" in diameter, with a low, rounded crown. 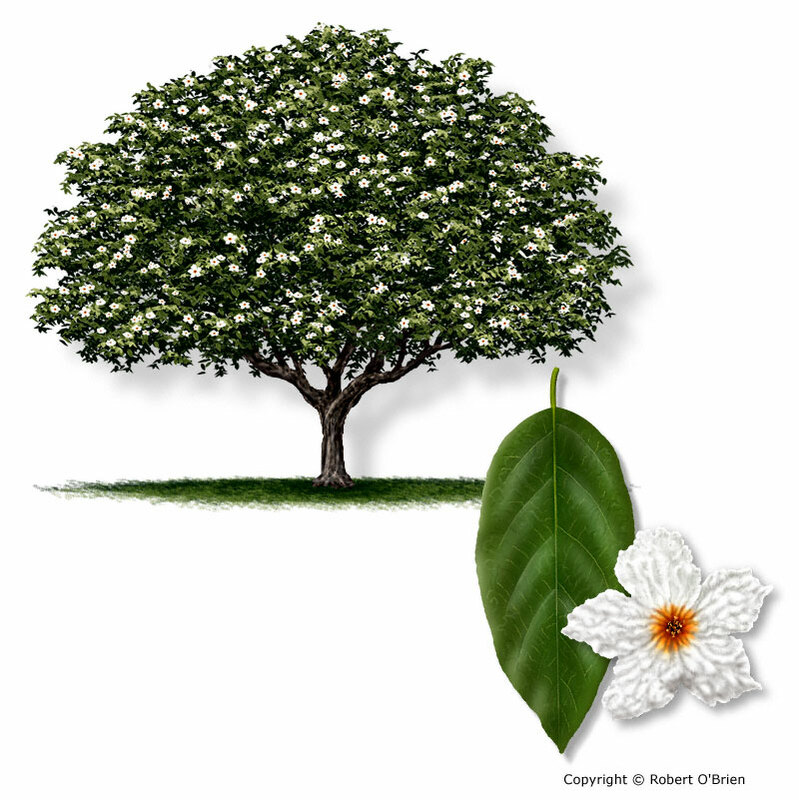 Native to the brushlands and forest remnants of the southernmost tip of Texas, this species is a beautiful landscape tree that can be planted as far north as San Antonio. Simple, opposite on the twigs, oval to oblong, 4" to 5" long by 2" to 3" wide, leaf edge without teeth, velvety on both surfaces, evergreen. Very showy, white, trumpet-shaped flowers, 1.5" long and 2" wide, with a yellow spot in the throat, appear throughout spring and summer with sufficient water. A whitish drupe, about 1" long, with sweet, pulpy flesh. Favored by wildlife and edible by humans. Gray to light brown, strongly fissured with flat ridges even on small stems, fibrous and interwoven. Wood is sometimes used for woodenware and yokes. Sold principally as a landscape tree. Buttonbush (Cephalanthus occidentalis) has smooth leaves 3" to 8" long; white fringetree (Chionanthus virginicus) occurs in East Texas and has smooth leaves. Jelly made from the fruits is used as a household remedy for coughs and colds.